A lady was wondering how best to negotiate, or end a domestic difficulty. What did the Tarot show about what seemed likely to happen and when? What was the advice? I drew The Hermit and The Queen of Cups. The versions of The Hermit shown here are drawn from The Gilded Tarot, by kind permission of Ciro Marchetti, and The Golden Tarot by Kat Black, by kind permission of US Games Systems. 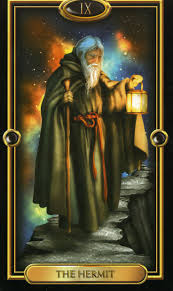 The Hermit shines a calm light. He is a path finder, representing calm and maturity, and he also represents a need for reflection, time out, a bit of peace and quiet. 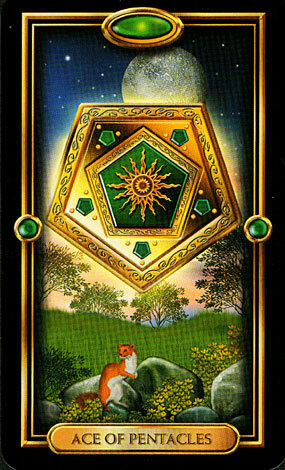 This card also represents the zodiac sign of Virgo, and a date range of 23 August – 22 September. I suggested therefore that late August looked like crunch time for the relationship, while the Queen of Cups – (this card is also from The Golden Tarot) suggests a happily married woman or a woman becoming a mother, and this, sitting in the future or outcome position, seemed to bode favourably for the prospects of a workable resolution, and restoration of harmony in the household. I was then informed that a baby was due in late August. So there we have it, the Hermit was literally, pronouncing upon dates for the Queen of Cups new arrival. If I was a proper psychic, of course, I’d just have looked in my crystal ball and said so straight out. But there it is. I ain’t, I’ve got to use my Tarot, and then I need to think about it, and as for the headgear, forgeddit. Author Katie-EllenPosted on February 16, 2018 February 18, 2018 Categories agony aunt, animal psychics, card meanings, cartomancy, future, help and guidance, Nature, prediction, tarot, The Golden Tarot, UncategorizedTags predicting dates with Tarot, The HermitLeave a comment on Tarot Timing.